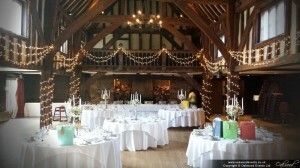 The pillars and Minstrel’s Gallery in the Tithe Barn at Great Fosters are perfect for draping with fairy lights. This is one of our most popular designs with lights wound around all eight pillars, plus swags of lights between the pillars and across the gallery. It frames the main area of the room perfectly and looks absolutely stunning, especially after dark when the fairy lights can be dimmed to create just the right sparkly atmosphere!